Beto O'Rourke surged to a 15-point edge over Ted Cruz in Hays County during last week's election, even though the Central Texas county hadn't voted for a Democrat at the top of the ticket since 1992. The rapidly growing Central Texas suburban county — Texas' 22nd-largest by registered voters – hadn’t voted for a Democrat at the top of the ticket since 1992. In this year's general election, however, it gave U.S. Rep. Beto O’Rourke, D-El Paso, a 15-point edge over Republican incumbent U.S. Sen. Ted Cruz. It was the first time in 13 general elections that the county flipped, even though it has become increasingly blue in recent elections. 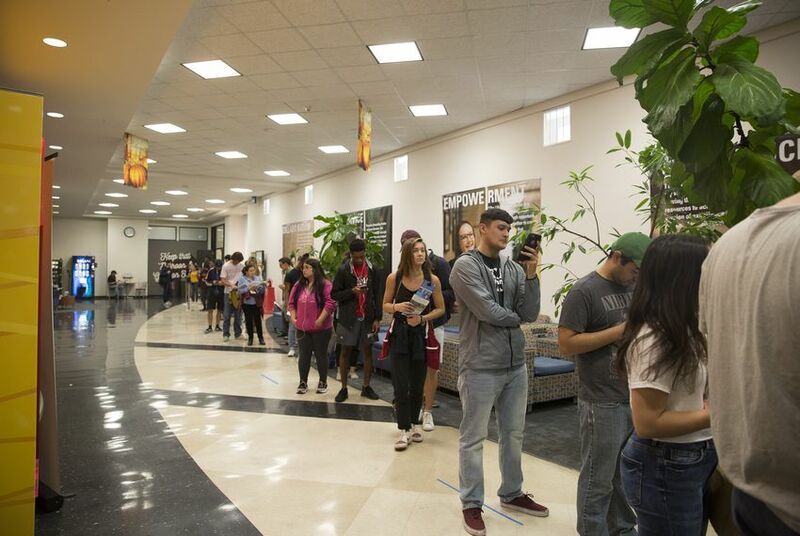 What exactly fueled the flip is still unknown – and it's most likely due to a slate of factors – but University of Houston political science professor Brandon Rottinghaus said the “off-the-charts-big” student turnout at Texas State University played a big role. “A lot of the voter turnout had to do with the university,” said Jennifer Anderson, the Hays County elections administrator. But she cautioned against reading too much into Texas State turnout because there were large increases in voter turnout throughout the county. It is too soon to track precisely where students cast ballots other than at the LBJ Student Center because voter rolls from this past election are not yet available. But, by all accounts, Hays County voter turnout was high across the board. Early voting turnout in the county, which reached 46.6 percent, surpassed total early voting turnout in the 2016 and 2012 presidential elections and the 2014 midterm election. Rottinghaus said that because counties do not typically make it easy for students to vote, they tend not to. And because student turnout is low, counties don’t put as many voting locations on campus. It’s a “self-reinforcing cycle,” he said. But Rottinghaus added that the situation at Texas State this election was different because of extended voting hours on campus. “If you make it easier for college students to vote, they will vote,” he said. Not only did more people vote at the LBJ Student Center this election than last election, they also voted more heavily for Democrats. Whereas 84 percent of voters in the 334th precinct supported O’Rourke over Cruz this election, only 66 percent of voters in that precinct supported Hillary Clinton over Donald Trump two years earlier. To be sure, the Republican areas across the county have also become redder over the past three elections as the Democratic areas have become bluer. Keely Freund, a Texas State senior and student government officer, said she saw O'Rourke's name plastered everywhere on campus – on T-shirts, water bottles, laptops and pins – in the months leading up to the election. She said that she was “not surprised at all” that O’Rourke won in Hays County because he made several campaign stops there. Adrian Cooper, a Texas State senior, also said he was not surprised. Though he voted for Cruz, he said O'Rourke ran a “very effective campaign” on campus. Rottinghaus attributed some of the flip to the “Beto effect"; His charisma persuaded more Democrats across the county to vote. 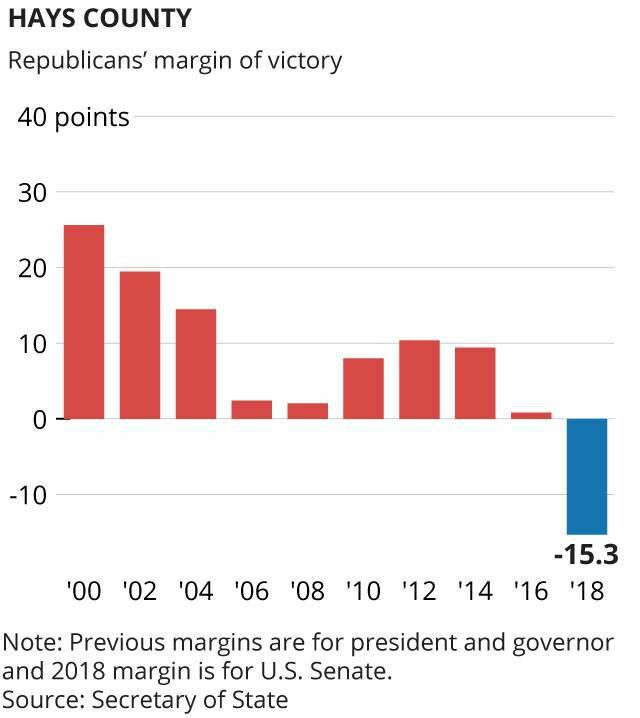 Election returns show that, for the first time in a general election since 2008, more Democrats than Republicans cast straight-party ballots — though the straight party voting option will no longer be available beginning in 2020. But Rottinghaus also said there are deeper changes that may have caused the county to flip: an increase in the number of older, progressive retirees who have settled into Hays County from Houston and Austin and more suburban women supporting Democratic candidates at the top of the ticket this election than in 2016. He said these changes could carry through to future elections. Even the candidate Rottinghaus described as “the weakest” — Democratic gubernatorial nominee Lupe Valdez — got more votes than Hillary Clinton this election, he noted. “There’s been a wholesale change in Hays County,” he said. The change in Hays County was mirrored in other counties across the state as well. Democrats flipped Tarrant County, long considered the most conservative urban county in the country, and suburban Williamson County. Republicans also lost some of their footing in Fort Bend and Collin Counties. Disclosure: The University of Houston and Rice University have been financial supporters of The Texas Tribune, a nonprofit, nonpartisan news organization that is funded in part by donations from members, foundations and corporate sponsors. Financial supporters play no role in the Tribune's journalism. Find a complete list of them here.